The nation’s top freshman in kills and aces continues to pile up honors. For the third time already this season, outside hitter Lauren Wicinski (Geneva, Ill./Geneva) was named Mid-American Conference West Division Offensive Player of the Week, announced the league on Monday. Wicinski was already the first NIU volleyball player to win the award twice as a freshman and now is the first two claim the weekly honor three times in a career, just six weeks into her rookie campaign. Sharing the award with Eastern Michigan’s Rachel Iaquaniello, Wicinski paced the Huskie offense as NIU posted two five-set wins over the week to mark its third consecutive MAC win. She totaled a team-best 47 kills (4.70/set) and .321 attack percentage, while also adding 18 digs (1.80/set), two aces, and four blocks for 52 points (5.20/set). 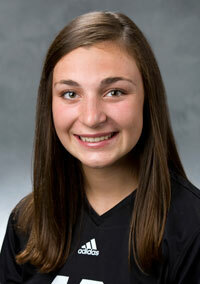 She netted double digits in kills in both matches to extend her streak of having 10 or more kills to 18 matches. She notched a season-high 29 kills at home against Western Michigan with a .309 hitting percentage, while also adding 12 digs, three blocks and an ace for her eighth double-double. She hit .342 with 19 kills, one block and an ace versus Miami (Ohio). As of Sept. 27, Wicinski ranks third in the nation in aces (0.74/set) and 10th in kills (4.68/set). Currently, she leads the MAC in kills (4.69/set), aces (0.66/set), and points (5.62/set). Off to their best start in conference play since 2006, Wicinski and the Huskies (17-2, 3-1 MAC) return to action at 6 p.m. Friday, Oct. 8, against Central Michigan (7-9, 1-3 MAC) in Mount Pleasant, Mich.